I wanted to make a holiday treat for our Christmas Eve dinner that was delicious, indulgent, decadent and still somewhat healthy. I also really wanted it to look as good as it tastes. This no cook super food fudge met all the requirements!!! It's so easy to make. You literally just toss a few ingredients in the blender...whip it up, spread it, sprinkle it and chill it. Done. It's that easy. A beautiful dessert to bring to a holiday party, dinner party or to keep on hand for a late night treat. Pairs perfect with a glass of Malbec. I hope you guys love it as much as we did. Line a small glass baking dish or loaf pan with parchment paper so you can easily lift the fudge out when it's chilled. In a blender, combine the dates, Shakeology or cocoa powder, coconut oil, coconut butter, vanilla extract, sea salt, maca powder, cinnamon and nutmeg. Blend until well combined and creamy. You might need to scrape down the sides and mix it as you go. Pour into your baking dish and press it flat and even with a spatula. 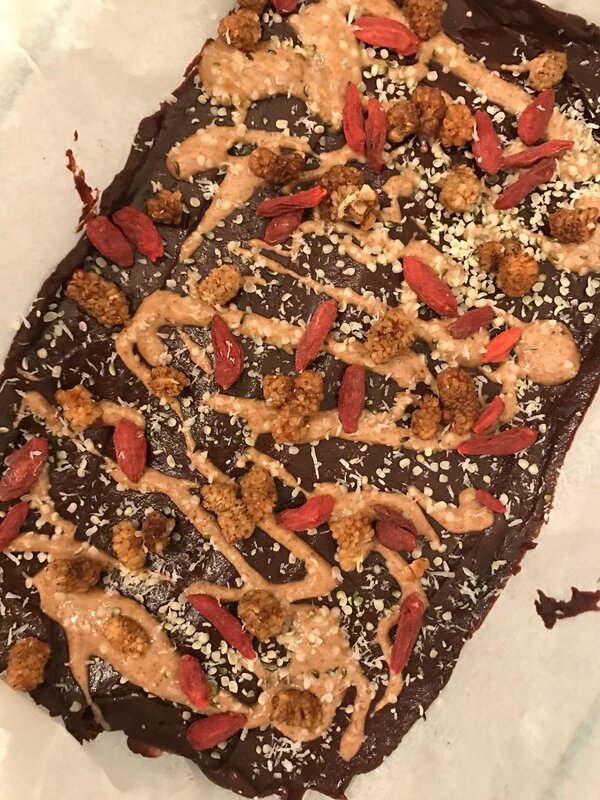 Drizzle with unsweetened almond butter and sprinkle the top with hemp hearts, coconut flakes, mulberries and goji berries. Cover with parchment paper and chill 2-4 hours.